8 ft. (2.4 m) h. x 6 ft. (1.8 m) w. x 18 ft. (5.5 m) d., wood, Plexiglas, sheetrock, moss, weather, 1999. Installed in the one person exhibition, Morphology of Change, at the Lance Fung Gallery, New York, NY. 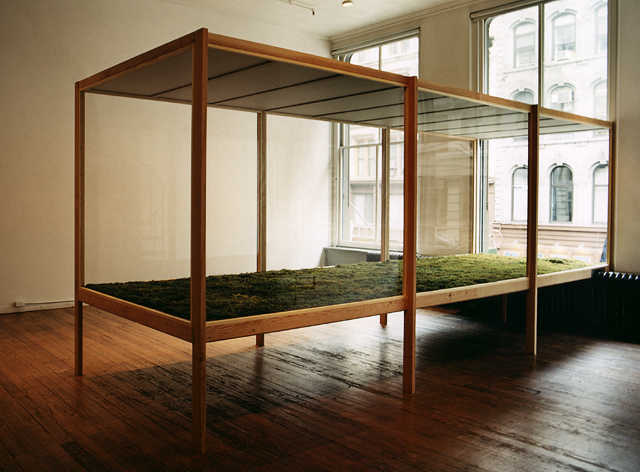 A horizontal field of native California and Massachusetts moss lining a vitrine-like structure open at one end to the environment of New York City. Installed in the one-person exhibition, Morphology of Change, at the Lance Fung Gallery, New York, NY, Holocene Terrace, is a transparent, wood-framed structure that extends the open portion of one of the gallerys street-facing windows into the center of the exhibition space. Within the chamber open only to the outside world is a field of living moss from California and Massachusetts. The moss is subjected to the environmental conditions of New York City for the length of the exhibition; on dry days the moss is a dormant grayish color, on rainy days--to the extent that weather can reach within the structure--a vibrant green. Holocene Terrace is a niche in the canyon wall of Sohos Broadway, the moss a suggestion of the plant growth possible on the rock formation that is New York City. The project site on Broadway is considered as one canyon of many canyons comprising the infrastructure and architecture of New York city. This formation was constructed by human agency analogous to geologic processes such as erosion (quarries), metamorphism (fired brick, etc) and deposition (masonry) with a morphology having a generally rectilinear morphology similar to non-eroded geologic terrain and tectonic structures. The rate of deposition (construction) in this case is in human time while the erosion can be in geologic time (natural environmental denudation/transformation) or human time (deconstruction of the structure). The geologic history of a site in deep time can be considered as both land and sea: plate tectonics as well as terrestrial, marine, fluvial and lacustarine deposition invariably is part of that history. As part of the conceptual response to the site and exhibition, an unrealized bathymetric survey of this assemblage was devised using side-scanning sonar towed from a "sky ship" dirigible. Ground-penetrating radar examines the internal architectural and sub-surface civic infrastructure. The skyship system would be operated at the level of actual or hypothetical "sea-levels" from the site's geologic past. See - Sea Within the Land: Environmental Bathymetry / Multi-beam/Side-scan Sonar Works/Concepts / 1999-2016.